Details of the modelling method described can be found in , . The engine studied is a 1.2 litre three cylinder spark ignition naturally aspirated engine. Figures 1, 2, 3 and 4 show simulation result for knock intensity, at spark advance of 10, 13,17 and 20 crank angles (CA) respectively. The BMEP values only consider pumping losses and friction losses in this case. It is seen in all cases that low load high engine speed points have less tendencies to reach auto-ignition than high load low engine speed points. 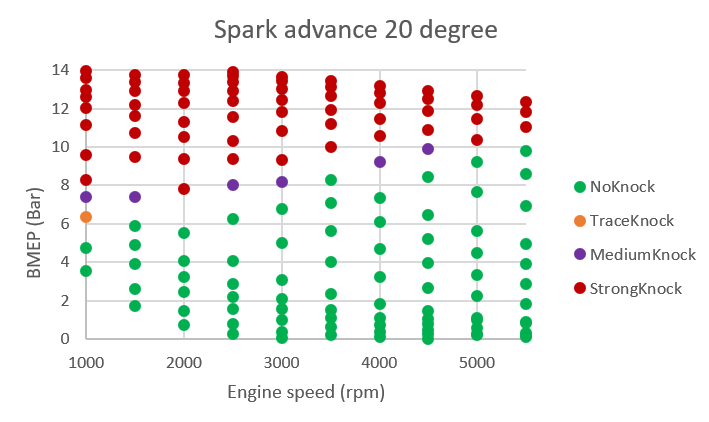 Increasing spark advance will increase corresponding BMEP at each speed point, but knock tendency is also increased. 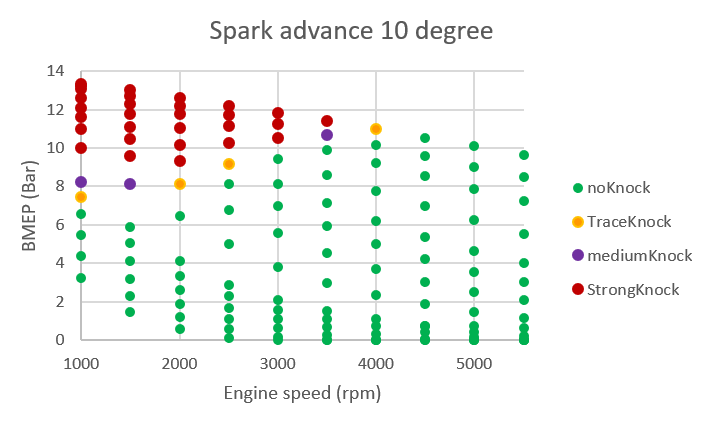 For example, no knock is observed at 5500 rpm for all load points with spark advance of 10 CA, figure 1. 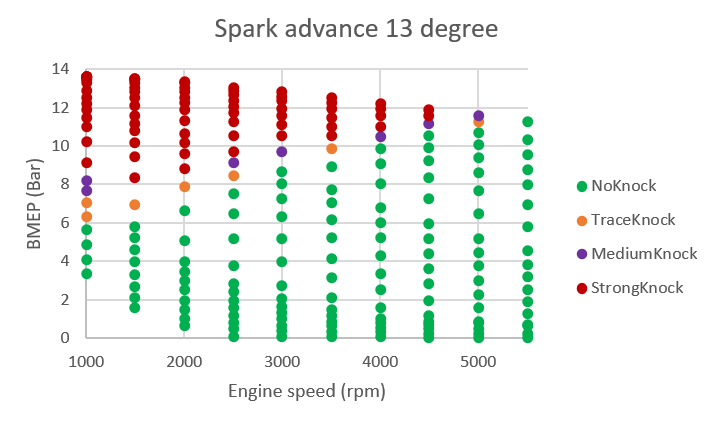 This is the case also when the spark advance is increased to 13 CA, figure 2. 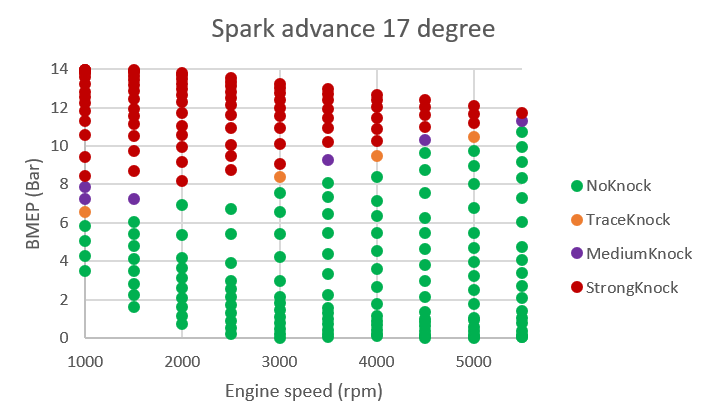 One strong knock and one medium knock points are observed with the spark advance of 17 CA, figure 3. Three strong knock points are observed with spark advance increased to 20 CA. Increase of spark advance by 3 CA is sufficient to go from medium knock to strong knock. Knock behaviour can also be affected by residual gas and Air Fuel Ratio, effect of that to knock will be studied in the future. S. Richard, S. Bougrine, G. Font, F.A. Lafossas and F. Le Berr, “On the reduction of a 3D CFD combustion model to build a physical 0D model for simulating heat release, knock and pollutants in SI engines”, Oil & Gas Science and Technology, volume 64, No. 3, pp. 223-242, 2009. J.B. Heywood, “Internal combustion engine fundamentals”, McGraw Hill Book Company, 1988.